Working with Wysing Arts Centre/Kettle’s Yard, the young people developed their artistic side by designing and making products to sell in their shop. The items they made included, phone covers, badges, jewellery and artwork. They had a lot of fun making the products to sell and it really made them think about product design, what customers would want and of course, setting prices. Part of the project was to develop the brand and marketing. 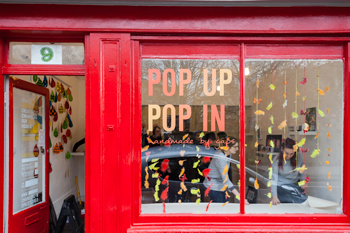 They came up with the concept and logo calling the shop “Pop-Up, Pop In”. They designed how the shop would look inside and how to display and dress the products. All in all they had a very successful few days, putting their learning into practice and they raised £303 for the local children’s Hospice.